Mark Espinoza (Phoenix) - Book Appointment Online! 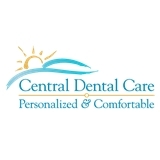 Central Dental Care has been serving the Phoenix area for years. We provide personalized , comfortable dental care for all generations. We are open 7am-7pm 7days a week!